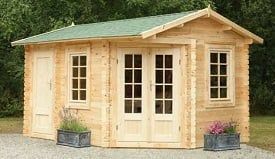 A stylishly practical corner summerhouse with integral store/shed, the Forest Garden Pickering, gives you the best of both worlds while fitting unobtrusively into the corner of your garden. For the opposite corner of your garden the Ripon is the mirror image of the Pickering finished to the same specification and price. Note that the Pickering is sometimes marketed as the Seddon and the Ripon as the Renwick. The Pickering is finished in 44mm interlocking logs, planed smooth for a pleasing finish and chalet cut at the corners for additional weatherproofing. The roof is of 19mm tongue and groove boarding while the floor is completed in sturdy 28mm T & G. The opening side windows and double doors feature double glazing for additional weatherproofing while the roof is finished off in attractive felt shingles. The summerhouse doors are glazed full length and the side door to the store is of solid wood. The building is supplied with pressure treated floor beams. Other than the floor beams, the Pickering is supplied untreated. A suitable finish will require to be applied at the time of erection. A shingle roof option may be available from some suppliers at additional cost. Check the relevant website to see which version is on offer. The Pickering is supplied ready for erection and treatment. Delivery charges may apply depending on your location. If you own a Pickering or Ripon Corner Summerhouse we'd be delighted if you'd submit a review to help other prospective customers. You can do this on our Corner Summerhouse Review Form - we look forward to hearing from you.